This painting is "Voice of Fire," by Barnett Newman. It's around 18 feet tall and 7 feet wide. In 1990, the National Gallery of Canada purchased it for $1,800,000. n uproar ensued. That's because the painting is ... well, it's pretty simple. It consists of three solid vertical stripes of equal width, blue/red/blue. Now, I'm not much into art, so I'm one of those "uproar" people. I just don't get the idea of spending almost two million taxpayer dollars on this. But ... well, maybe it's my own ignorance. Maybe I just don't get art, the same way Joe Morgan doesn't get sabermetrics. So, I've put together some possible reasons that someone might think this painting is worth the cost. I'm hoping you guys can help me out, maybe let me know if I've hit on something. Maybe this is just a beautiful work of art, and I don't appreciate its beauty enough. If that's the case, though ... why did it take until 1967 for someone to discover how well those vertical stripes go together? Why didn't the fashion industry figure this out and put it on ties or blouses long before that? And is there some subtlety that I don't get? Does the blue have to be exactly the right shade, or it looks ugly and amateurish? Would it not work in other colors completely? Even if that's the case, that it's so aesthetically striking ... why not put up a reproduction? You wouldn't have to copy it exactly, just hire some guy with a canvas and a roller. Seriously ... I've never heard anyone say that it's the detail, the brushstrokes, that make it so nice. It really just seems to be stripes. I don't mean to suggest that it's ugly or anything ... I honestly like it. I just don't see how it's so good that the public needs to be able to see it, or how it's worth $2 million. It's not a question of "is it nice." There's lots of nice out there. It's a question of, "is it $2 million National Gallery nice?" What is it that makes this a "major league" piece of art? Bobby Fischer moves his rook. Weeks later, after analyzing the game, critics realize what a great move it was -- it won the game for him. But ... there's nothing special about the WAY he lifted the piece, or even the beauty of the board. It's that the move was a brilliant answer to the question, "what's the best response to that other move?" Maybe that's it. Maybe "Voice of Fire" is a culmination of an abstract art conversation. One guy does green splotches, and another guy paints yellow cubes, and the connoisseurs see it as a stunning follow-up, and then this guy says, "I have the perfect response!" And he does 17-foot stripes, and the art people appreciate the subtle nuances of the riposte, because that's the way art works.
" ... there’s a level of importance to the work, which has social value to many people ... it isn’t enough to simply look at a painting and evaluate it on the basis of how elaborate it is. In order to enjoy the work and see its value, you have to learn more about it." Still: why not a reproduction? And an explanation? Tyler Cowen writes about "mood affiliation." That's when people adopt a certain feeling, position or attitude, and then reject anything not consistent with that mood. For instance, just try to get any rabid Republican to say anything good about Barack Obama. Try to get an environmentalist to say something bad about an Al Gore policy prescription. You can't. They just identify so strongly with one side, and it feels so good, that you can't help opposing anything on the other, or you'll break your emotional bubble. Maybe in this case ... well, some people like art, and they feel that government should fund art, and the public should see art, and art it subtle, and art is best appreciated by experts. And, so, any view that challenges their good feeling about their views, even if it's reasonable and not really that threatening, doesn't penetrate. The idea that some paintings aren't worth it -- or that "simple" abstracts are less worthy than, say, portraits -- creates an "urgent feeling that the idea needs to be countered". They all love art, and none of their fellow art-lovers would even think of breaking the taboo by suggesting that the painting isn't worth $2 million. I own a few game-worn NHL jerseys. They were expensive. Looking at them, you can't tell them apart from the official jerseys you can buy at stores or online, the ones you have custom made by the same companies that make the real ones. But ... these were worn by actual players, in actual, real NHL games! That makes them worth substantially more. There must be some invisible aura ... or maybe it's Hal Gill's actual, real-life sweat molecules that get me to reach deeper into my wallet. Is that what's happening? 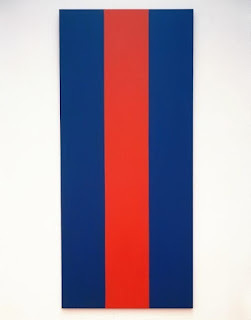 his is a real, original, Barnett Newman painting. Who cares how good it is? He painted it! It's like the jersey Don Awrey wore in Game 1 of the Canada-Russia series. Who cares if the sportswriters said he played very poorly that game? It's an important artifact! I actually have some sympathy for this view, as you may guess. It would explain why a reproduction just wouldn't do. (Well, it would suggest why the price is much higher for the original, anyway.) And it would explain why galleries don't really seem to offer a lot of reproductions. You'd think they'd want to show the best art, to the best of their ability ... but, maybe it's about having a nice collection of originals. Nobody lines up to see a photocopy of the Honus Wagner card. Suppose the painting appreciates at the rate of inflation. Then, the only cost is the foregone interest on the money used to buy it. Suppose that's 5 percent a year, or $40,000. Is it possible that "Voice of Fire" attracts an extra $40,000 in revenue, through Gallery admissions or sales? Recent admission and parking revenues were around $2 million for the year (.pdf, see page 31). Most of that is for the special exhibitions, I would think. It doesn't seem to me like 5 or 10 percent of patrons wouldn't bother coming if "Voice of Fire" weren't there. Maybe, legally, you can't exhibit a reproduction, so you have to buy the original. Or, maybe you can, legally, but, morally, there's an unwritten rule in the art industry that it's wrong to reproduce the idea, even when it's so simple that it can't be copyrighted, out of respect to the artist. But that only explains why you don't hire a guy with a roller. It doesn't explain why you should think this canvas is worth $1.8 million, instead of, say, a few thousand. Finally, maybe the critics are right ... and it's all just bullsh*t. It really IS just an 18-foot canvas with three stripes. "You have to look at your understanding of the metaphysical dimension of life." Geez, I couldn't make up something BSier if I tried. It's almost self-parody. So, what is it? I think it's all of these, in some proportion. My hypothesis is that there's a certain amount of context involved, but it's still mostly mood affiliation, bullsh*t, and groupthink. I hypothesize that, just like intelligent Republicans can convince each other that Obama wasn't born in the USA, intelligent art fans can get jobs at the Gallery and convince each other that three stripes is a good way to spend two million dollars. Nobody who works in the artistic community can, or wants to, say the emperor has no clothes. And those who do, being outside the art world, are seen as uncomprehending philistines to be dismissed. Am I wrong? I know there are art fans reading this. If you disagree, tell me why this painting is a piece of important art that's worth $2 million. I truly want to know, and I mean that in the sense that I really am keeping an open mind. Sorry about the occasional ragged left margin. Blogger now leaves spaces intact, so when I use two spaces after a period, Google leaves them in even if it moves the margin. I'll have to do something about that eventually. You're right. As usual. It's a classic example of idiocracy. Both stories reveal that we place some psychological value on authenticity. Whether that psychological value is worth $2M in this case, I don't know enough about art or the artist to say. So, I think that valuing art is virtually impossible--it's worth what collectors are willing to pay, and I don't think it's really useful to say "wow that guy spent $2 million on a Damien Hirst, what a moron," since really you or I have no opinion about Damien Hirst. So the interesting question to me regards how the museum uses taxpayer money, and it seems to me that if you are going to have a national museum, the only way for it to operate is to put people and a Board in charge that have some experience in the area, have a budget, and can spend that budget on art as they see fit. It's impractical to give the population of Canada a veto over decisions the Board makes, no? I'm not asking any political questions. I'm asking ART questions. What makes the painting valuable and worthy of being exhibited in a public gallery? What makes it worth -- to the Gallery -- $1.8 million more than a reproduction? What many art people would say is that it's not the 'culmination' of a conversation, it is moving that conversation forward. People have been arguing about what 'art' is for centuries, and a major objective of some abstract artists is to challenge viewers' assumptions about their definition. Some of those assumptions are about beauty and the importance of virtuoso skill; many would argue you can have great art without either. In that way, this blog post and comment is part of the artists' objective. Art of this sort had been raising these sorts of questions for years before the purchase, so you could say that the the gallery was buying the conversation. Which, while perhaps not as traditionally beautiful as a Caspar David Friedrich landscape, probably generated more attention and perhaps even visitors and revenue than the landscape. And made people think more about art. Is that "worth" $1.8MM? Is it worth that much to Canadian taxpayers? Heck if I know. If taxpayer-funded institutions are going to fish in the same waters as billionaires, you have to pay their prices. If you're going to buy major works (and some segment of the market obviously thought this one was), pricetags will be seven figures. You could argue that the gallery didn't have to spend the money on art, or on 'name' art--it could have invested in visitor outreach, or in less expensive works of unknown artists, in hopes that they would eventually become better known. Or it could have returned the money to the taxpayers. But then we start getting into incentives for bureaucrats, so I'll stop there. "Buying the conversation". That's a much better answer than I was expecting. Thanks, Jeff. I would buy "Voice of Fire" and "Voice of the taxpayer"(a house painters reproduction for $423 in materials). You hang them at opposite ends of the gallery and let the eye of the beholder decide which one is the more valuable. I would actually petition the government to buy the house painters version as a "metaphysical representation of the art world dichotomy between the value of taxpayers dollars and art for art's sake" Trust me, I used to go out with an artist and sometimes the bullsh*t piles up so high you need wings to stay above it. These "artists" have to self-perpetuate the myth that they know better than us heathens because their jobs depend on it. If they had to get a real job with their skills the first question out of a potential employers mouth is "Can you flip burgers?"